Trade disputes have dominated relations between the world’s two biggest economies in recent weeks, as Washington and Beijing have slapped tariffs on goods from their respective countries. 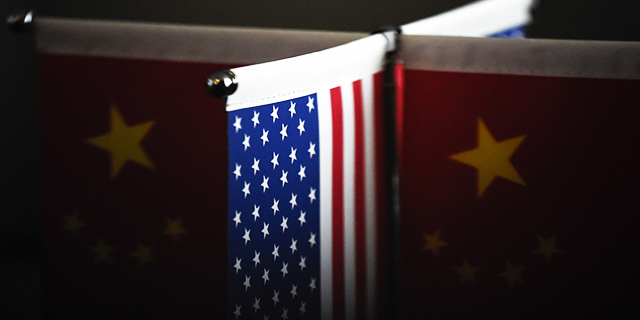 Although tensions over trade are hardly new, they have intensified during the Trump administration, and as a new Pew Research Center survey illustrates, American attitudes toward China have become somewhat less positive over the past year. Overall, 38% of Americans have a favorable opinion of China, down slightly from 44% in 2017. 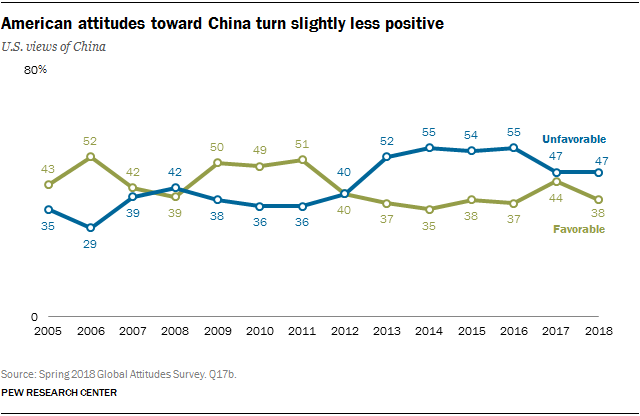 Attitudes toward China have fluctuated to some extent in recent years, becoming more negative during the 2012 election cycle, but more positive in 2017, before this year’s decline. When asked whether they are more concerned about China’s military or economic strength, a growing number of Americans choose the latter. 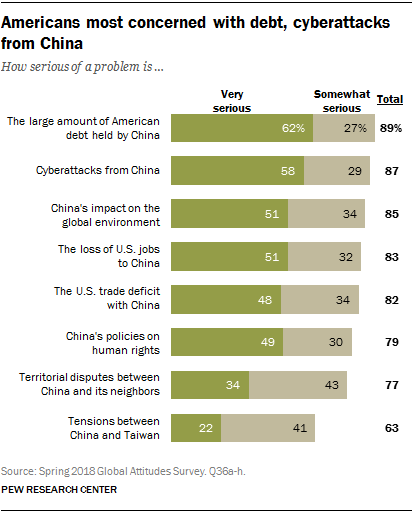 Economic issues also feature prominently in the list of concerns Americans have about China. Roughly half or more of those polled say the large amount of U.S. debt held by China, the loss of U.S. jobs to China and the trade deficit with China are very serious problems. However, many are also worried about other issues, including Chinese cyberattacks, China’s impact on the global environment and Beijing’s human rights record. Overall, specific concerns about China have remained stable over the past year. Worries about job losses, debt and the trade deficit are actually less common today than in 2012, when the economic mood in the U.S. was generally more negative. Over the same time period, however, Americans have become more concerned about the threat of cyberattacks from China. The new survey by Pew Research Center, conducted May 14 to June 15, 2018, among 1,500 adults, also finds that young people typically have more positive attitudes toward China. About half of 18- to 29-year-olds (49%) express a favorable view of China, compared with only 37% of those ages 30 to 49 and 34% of people 50 and older. Younger people are also much less concerned than older generations about cyberattacks and job losses to China. There are also notable differences along partisan lines. 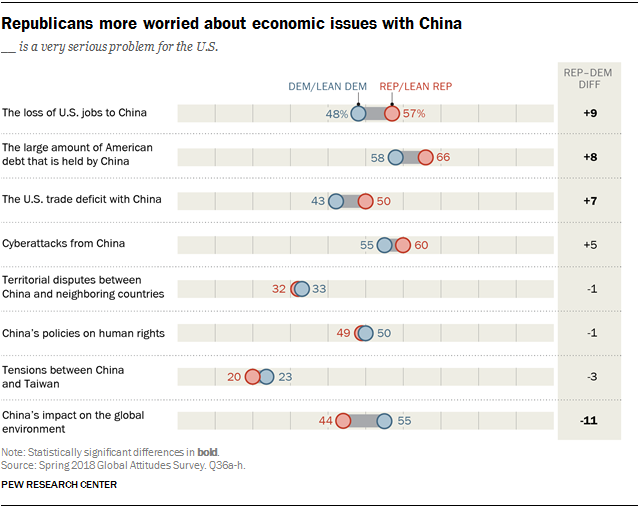 Republicans and Republican-leaning independents are especially worried about economic issues – such as debt, job losses and the trade deficit – in the U.S.-China relationship, while Democrats and Democratic-leaning independents are particularly worried about the impact of China’s growth on the global environment. Most Americans say they are more concerned about China’s economic strength than its military capabilities. 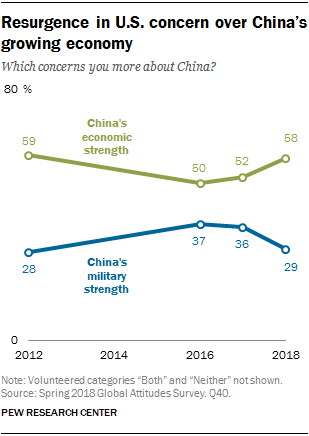 Nearly six-in-ten Americans (58%) believe China’s economic power is the greater threat, a 6-percentage point increase from 2017. The share of the public saying China’s military power is the bigger worry has declined 7 points over the past year. Concerns about China’s military had been on the rise in recent years, but the balance of opinion on this question now echoes that of 2012, when Pew Research Center first asked this question. Younger Americans (ages 18 to 29) are more likely than those ages 50 and older to identify China’s economic strength as the bigger threat of the two (65% vs. 52%). 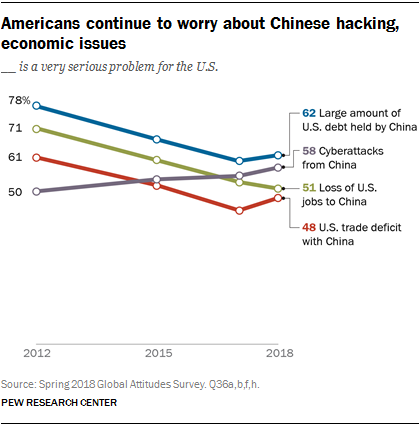 When asked about eight specific issues affecting the U.S.-China relationship, majorities of Americans rank all eight as at least a somewhat serious problem, with roughly six-in-ten citing the large amount of U.S. debt held by China and cyberattacks as very serious problems. Territorial disputes between China and its neighbors (34% very serious) and tensions between China and Taiwan (22%) generate fewer concerns than the other issues tested. Worries about economic problems are less common now than in 2012, when these questions were originally asked. Concerns about cyberattacks have continued to increase modestly over the past six years. Republicans are somewhat more likely than Democrats to say economic tensions between the U.S. and China are very serious problems. The partisan gap is especially notable when discussing U.S. jobs moving overseas to China, Chinese-held American debt and the bilateral trade deficit. Only when asked about China’s environmental impact do significantly more Democrats voice anxiety. Since 2012, worries about economic issues in the U.S.-China relationship have diminished among both Republicans and Democrats, though a partisan gap still remains. For example, concerns about the Chinese government holding large amounts of U.S. debt – the most serious issue for both parties – has decreased 19 percentage points for Republicans and 17 points for Democrats over the past six years. Meanwhile, the gap between the parties on cyberattacks is narrowing, with 55% of Democrats and 60% of Republicans agreeing about the seriousness of this issue.